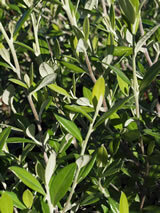 Attractive native shrub with erect branches covered with grey green foliage giving it a silvery appearance. In summer it has starry yellow flowers followed by orange-yellow fruit. Great for coastal and exposed gardens. Hardy. Avoid sites that are boggy in winter. Excellent hedge plant. Bred by Mike Geenty of Hamilton.